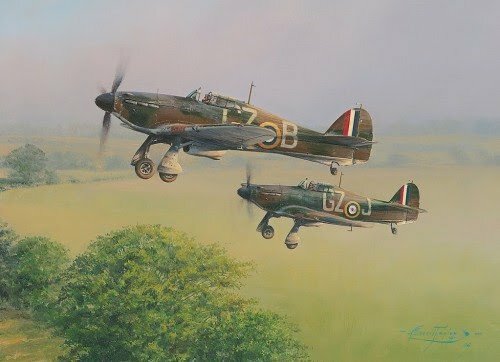 A pair of Mk.I Hurricanes from 32 Squadron lead the scramble away from their forward airfield at the height of the Battle of Britain. Often making four or five such scrambles a day, this time they are racing to intercept Luftwaffe intruders who have been spotted crossing the Kent coast. The prints in this fabulous cameo release are signed by a number of the ‘Few’, the men who fought and won the Battle of Britain. Flew as an Observer on Blenheims with 219 Sqn throughout the Battle of Britain. THE COLLECTOR'S & REMARQUE EDITIONS These FIVE signature Collectors Editions are additionally signed a further three famous Aircrew who flew and fought in the Battle of Britain.